The best thing we can say about Thursday's stock market trading is that it is now over. 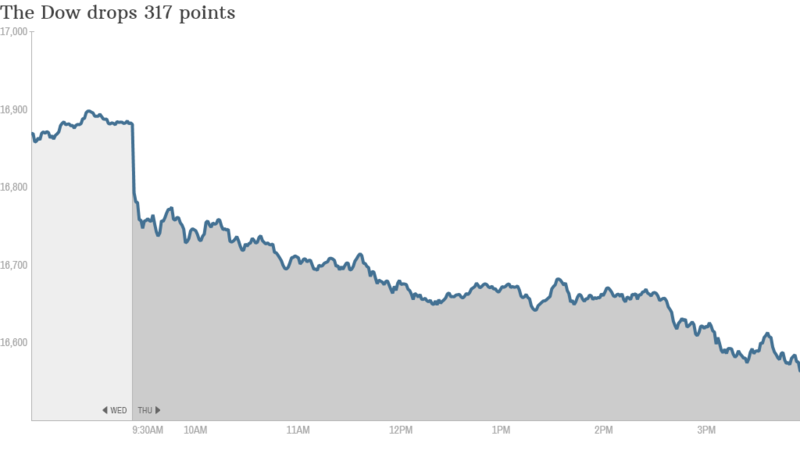 The Dow fell 317 points, erasing all of its gains for the year. The S&P 500 and Nasdaq fell sharply as well, each down about 2%. They gave back the all the gains they had made in July. Heavy selling overseas, driven by worries about Argentina's latest debt default and more problems with a big Portuguese bank, combined with a slew of negative earnings and a disappointing outlook on manufacturing from the Federal Reserve Bank of Chicago to drop stocks. The VIX (VIX), a gauge of market volatility, jumped almost 27%. CNNMoney's Fear & Greed Index, which includes the VIX and six other gauges of sentiment, is showing signs of "Extreme Fear." International markets: European markets fell broadly, with the EuroStoxx 50 index ending the day down 1.7%. Lisbon-listed shares of Banco Espirto Santo (BKESF), the Portuguese bank whose deteriorating funding situation have brought the spotlight back to Southern Europe's shaky banks, was down 42%. Asian markets, outside of strongly performing Chinese stocks, were also lower. Argentina failed to reach an agreement with bondholders and defaulted late Wednesday. Argentina's benchmark Merval index plunged more than 8%. Food fails and other movers: Yum Brands (YUM), the conglomerate behind KFC, Taco Bell and Pizza Hut, warned that the tainted meat scandal in China could hurt its profits for the year. The stock dropped 5%. 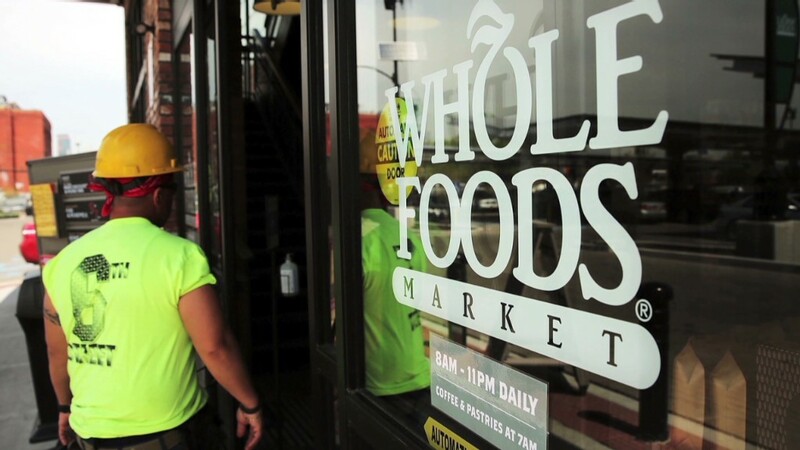 Whole Foods (WFM) is also hurting. Despite reporting good earnings, the company disappointed on sales and also cut its outlook guidance once again, raising questions about the company's future direction. Its shares, which have been among the worst performers this year, are down more than 2%. Kellogg (K) did the same, reporting a good quarter but cutting guidance. Kraft (KRFT) had an out-and-out bad quarter. Both stocks fell more than 6%. 3-D printing stocks are sinking after a poor earnings report from 3D Systems (DDD). Its shares dived almost 11% and that put pressure on rivals voxelJet (VJET), Stratasys (SSYS) and ExOne (XONE), which are all down. And momentum stock darling GoPro (GPRO), which has surged since going public, failed to live up to the hype. The camera maker's stock fell nearly 10% after hours even though earnings and sales topped forecasts. Bright Spots: But there was some good news after hours. Tesla (TSLA) and LinkedIn (LNKD) both rose in extended trading following better-than-expected results. A few big names managed to hold up well in regular trading too. T-Mobile (TMUS) was up 6.5% following reports that French telecom firm Iliad made a buyout offer. Sprint (S), long considered a potential merger partner, is down 5%. Business card maker Vistaprint (VPRT) surprised analysts by turning a profit on strong sales, skyrocketing 30.5%. World Wrestling Entertainment (WWE), after announcing that it was cutting 7% of its workforce, rose more than 3%. And red-hot grilled chicken IPO El Pollo Loco (LOCO) was up 12% today. Glu not holding: Glu Mobile (GLUU) developed a wildly popular game based around celebrity Kim Kardashian, but Wall Street isn't impressed. Even though results beat expectations, the stock is dropped 18% after announcing that it was buying Cie Games for $100 million. Impossible is Russia: Adidas (ADDDF), which finished the day down 15% in Germany, is also lowering its guidance, saying that its reducing its Russian footprint by closing stores or delaying new openings. Golf sales are also lower. It joins McDonald's (MCD) and Wendy's (WEN) in reporting difficulties operating in the country.